NEW YORK, Nov. 16, 2018 /PRNewswire/ -- Playa Vista Isle in Hillsboro Beach, Florida, previously offered up to $159 million, created a bidding war among 11 buyers and successfully sold at auction last night through leading global firm Concierge Auctions in cooperation with ONE Sotheby's International Realty. When closed, the transaction will represent the highest price ever achieved for a U.S. home at auction and the highest sale ever in Broward County. The global exposure generated by Concierge Auctions in the six weeks prior to auction resulted in over 1,800 inquiries and 29 viewings by interested buyers — a tremendous result for a property of this caliber. The winning buyer is a past client of Concierge. "The auction process continues to break records across every high-end asset class, and we're pleased to be the leader in the real estate sector," stated Concierge president Laura Brady. "Three months ago RM Sotheby's set a record for the most expensive car ever sold at auction for $58 million, and just last night Christie's smashed the record for a work by a living artist when it sold David Hockney's "Portrait of an Artist (Pool with Two Figures)" for $90.3 million. It's an exciting time for the industry." Playa Vista Isle is the only Ocean-to-Intracoastal Waterway estate on the Gold Coast to offer 500± feet of private oceanfront beach and two concrete deep-water yacht docks. 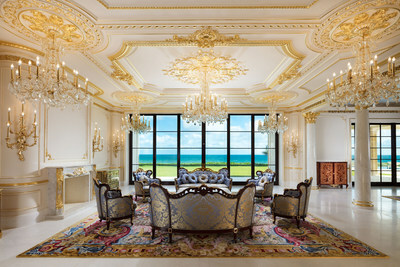 The 5± acre estate was completed in 2018 and features 11 bedrooms, 22 bathrooms, and 22-karat gold leaf gilding throughout. Additional amenities include the world's first private 3D-IMAX© in-home theater; 20-car garage with secure tunnel access; 3,000± bottle wine cellar with individually-controlled temperature and humidity secured by biometric access with adjacent tasting room; 4,500-square-foot heated infinity edge pool; oversize Jacuzzi perched 40± feet above the ocean featuring unobstructed panoramic views of the horizon; 13 water features including six waterfalls; and a putting green. The property also includes an adjacent lot that can accommodate an additional structure, garden area, or recreational facility. With its world-class finishes, Playa Vista Isle has been awarded the "World's Best Property," "Best Residential Property-Florida," and "Best Architecture Single Residence-Florida" by the International Property Awards.